French Model Railway: Spray painting the track. Two cans of spray paint arrived through the post - I think they are both too light in colour for my purpose. That purpose is too lighten the colour of the track sleepers so that they look like those in a photograph that I'm using as a guide. 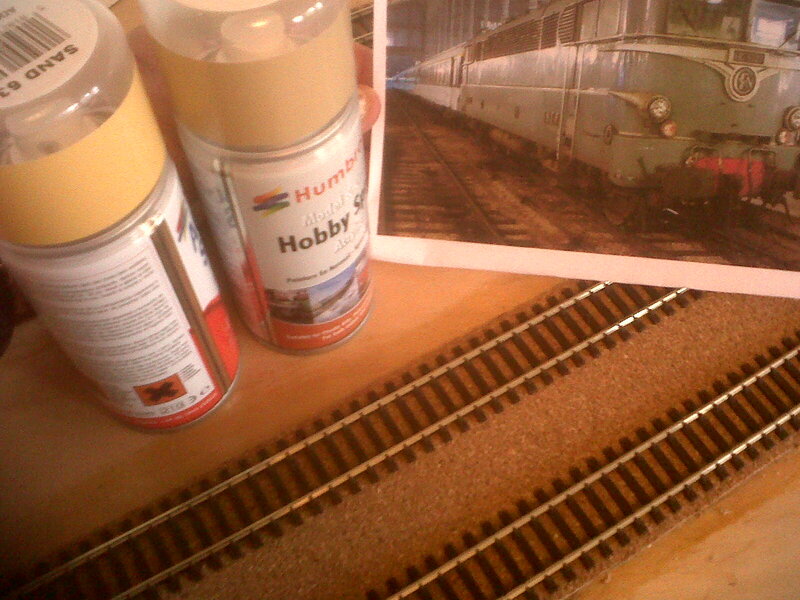 The track before spraying and the photograph I'm using as a guide. I only sprayed a few short sections because a) one needs to move in quickly with a paper towel to wipe clean the tops and inner flanges of the rails so as to ensure electrical conductivity and b) I wasn't wearing a mask of any kind and the intensity of the fumes caught me out. 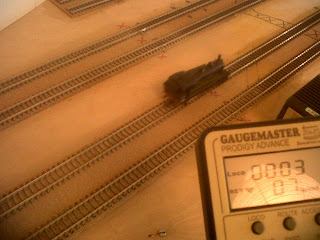 After wiping the rails I tested the track out and indeed my little Jouef ran smoothly over the painted sections of track. As you can see, the sleepers are now far too light in colour. I'll have to order a darker brown. 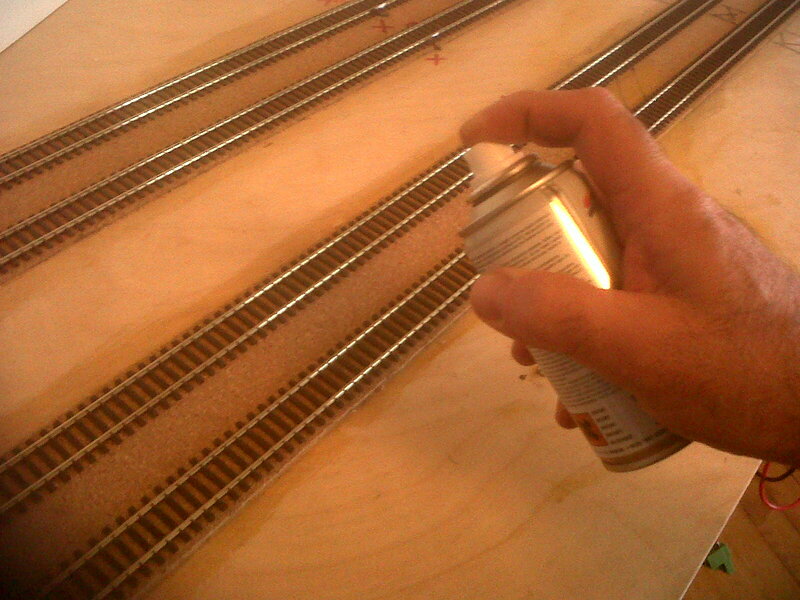 * The spray paint can actually be quite easily focused on the track and there doesn't seem to be a need for much in the way of protective screening. * However, the room quickly fills with fumes and without a mask or kerchief the paint catches in one's throat. But, I discovered that the large window in the room can be easily opened and next time I'll remember to tie something about my mouth and nose. * Paper towels successfully wipe the rails of unwanted paint, but next time I'll gather together many more sheets than I did today. 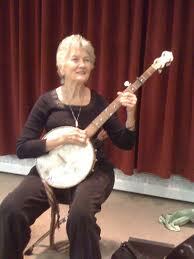 Read in the Telegraph last week that Peggy Seeger, the septuagenarian folk singer has recorded a new album of electronic dance music with someone called "Broadcaster". 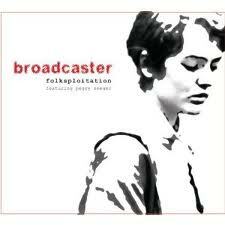 She was, if you'll forgive the pun, raving about the result. She made the point that these dance hall DJs take a melody and then build that up to something of symphonic proportions, in the same way that classical composers do. You tease us with such a concise description of the delicacy and then refuse to post a picture of it! Pah! Not the way to treat your loyal followers. Sorry, I slipped up there.